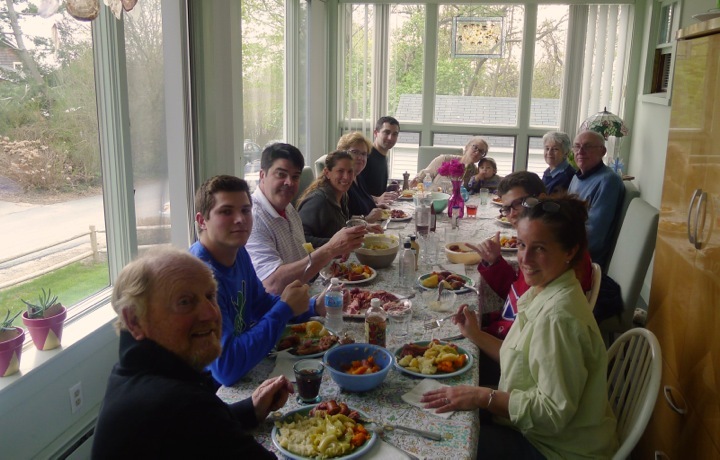 One of the best things in the world is to sit down and have a big family dinner. There’s just something really special about it! A lot of memories and past times are reminisced about while passing dishes around, and a lot of memories are made while you are sitting there, too. I always look forward to going home to my mothers house because we all get together, and 99% of the time food is involved. 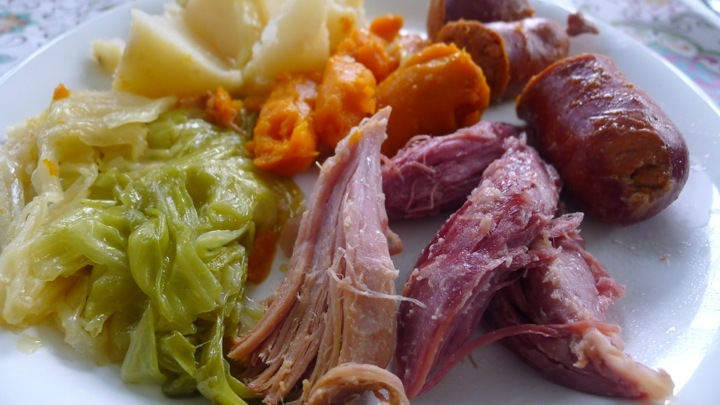 I’m assuming this is because we are Portuguese and love to celebrate family time with a big hearty meal! This weekend we went home to Rhode Island for Mother’s Day. 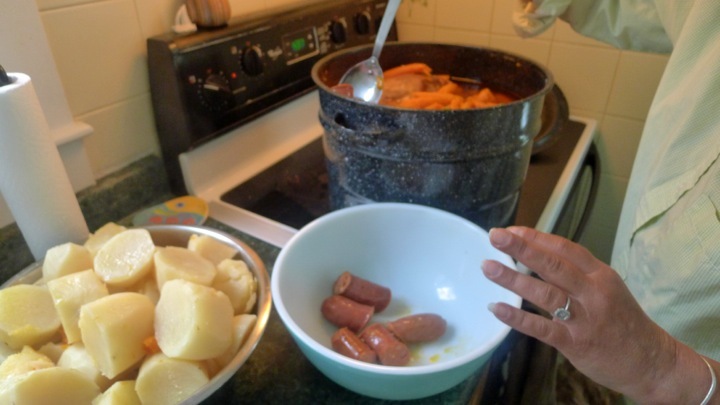 My mom was making Portuguese boiled dinner, which she has been making my whole life- it is one of those sentimental meals that I love very much. She learned how to make it from my great-grandmother, and yesterday she taught me how to make it. I have documented it here to share with you all! 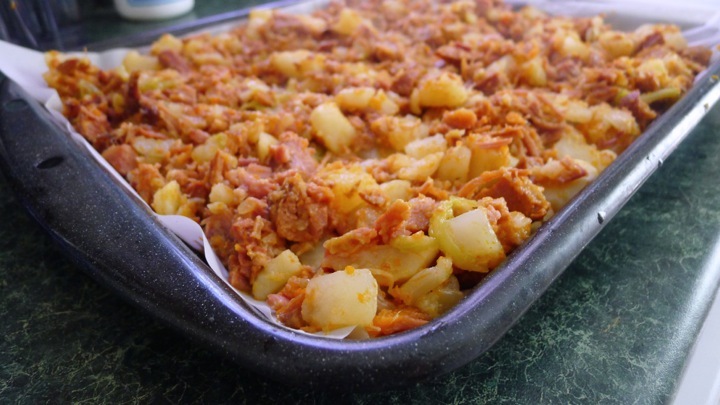 It is quite simple, but does take a few hours of cooking time. Well worth it though. 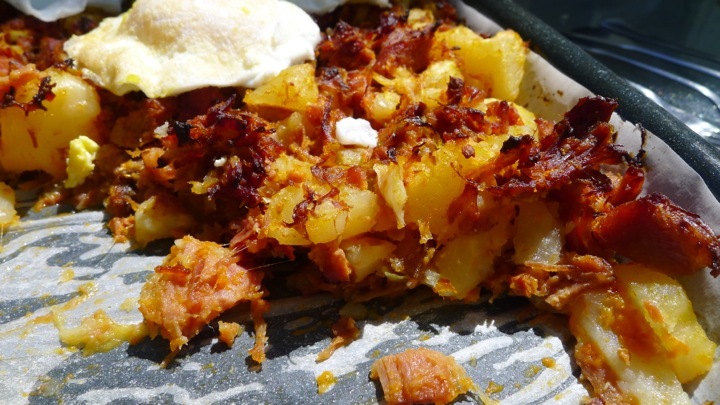 And what’s even better is the next day you chop up all the leftovers and make hash out of it- which I have also included in this post for you as well! Overall a wonderful weekend with my family! Happy Mother’s Day everyone! 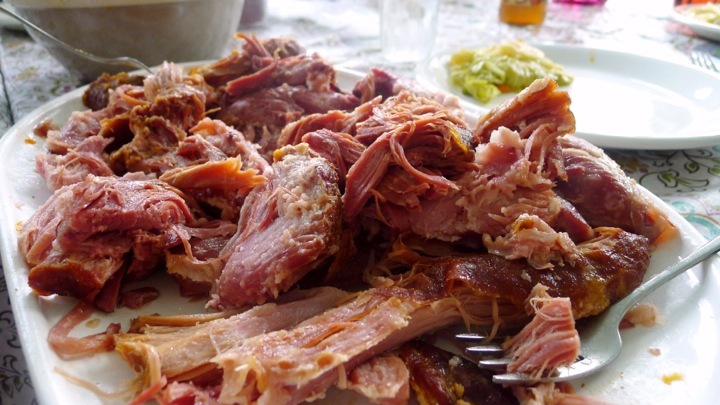 In a HUGE pot, add the pork shoulders and cover with water. Bring to a boil. In the meantime, cut everything else up. 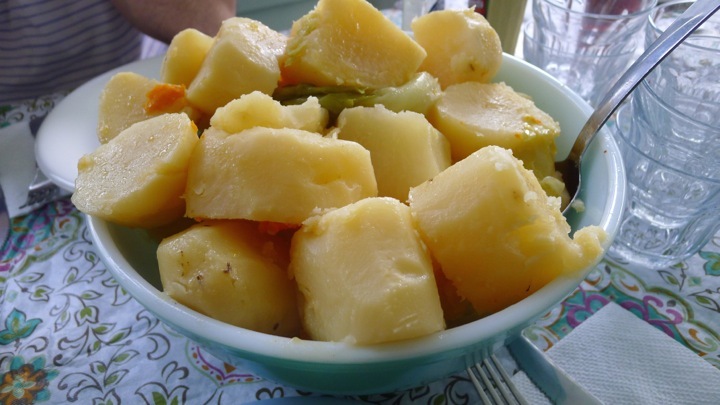 What you need to keep in mind is that all of these things will be cooking for a long period of time, so if you cut them to small then they will just cook down to mush. For the carrots, keep all the thin ones whole, and only slice the tops of the ones that are very thick. 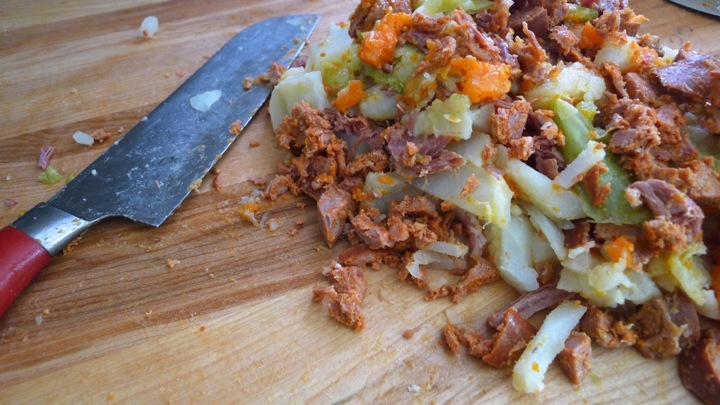 Next, core the cabbage and cut into quarters. Also peel and quarter the potatoes as well. 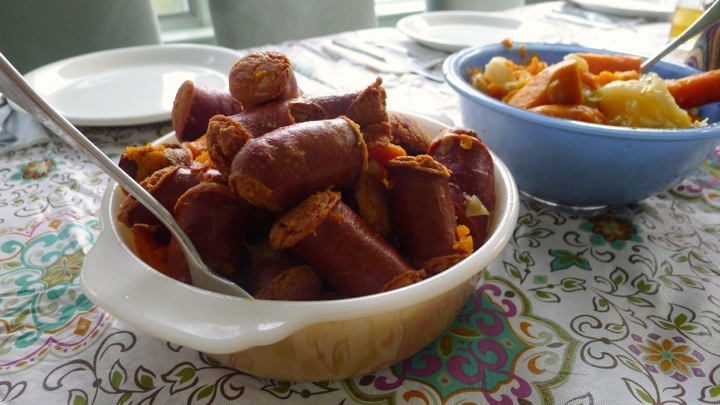 Finally, cut the linguiça and chourico into about 3 inch pieces. 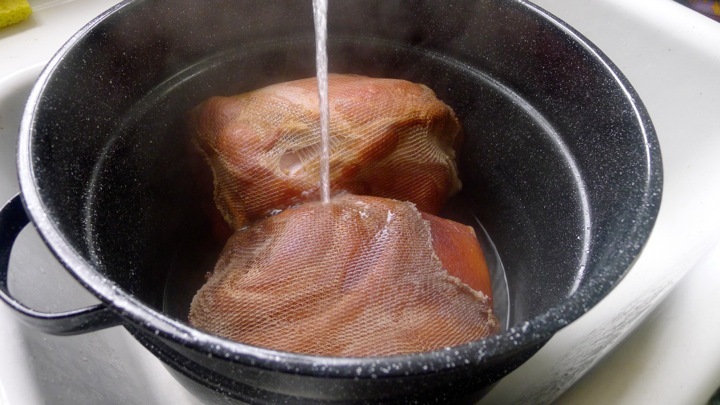 After the pork has boiled for 20 minutes, dump the water and fill it with new water. The reason you do this is to get rid of some the salt that comes off the meat. Add the linguiça and chourico to the pot, pushing it down around the pork. 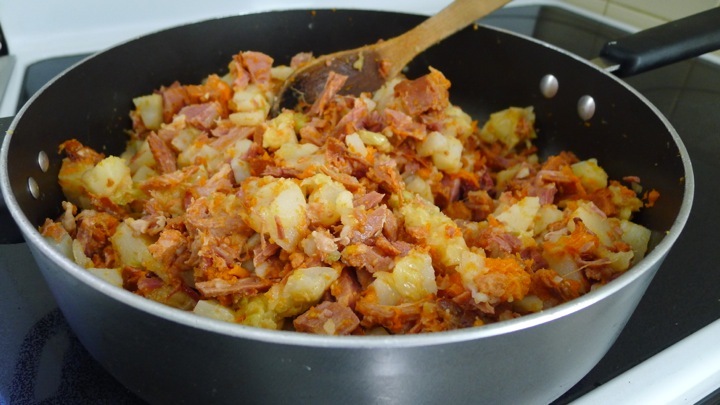 Add the carrots as well then cook for 1 hour. Next add the potatoes and cook for another hour. 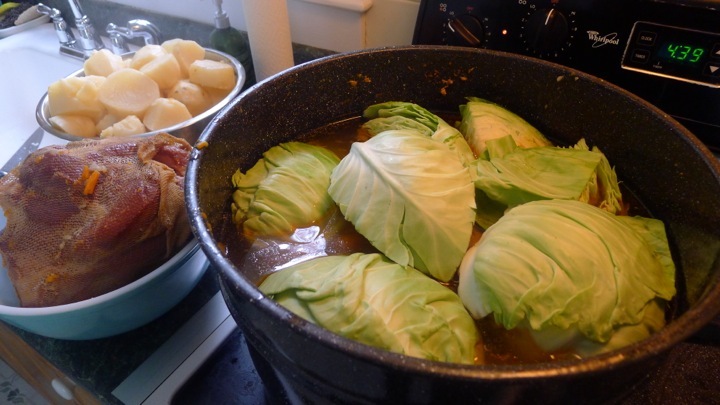 At this point, depending on how much room you have in the pot, you can either remove the potatoes and sausage or leave them in before you add the cabbage. It really depends on how big of a batch you’re making and how big your pot it. Seeing we were making a huge batch, we removed them then just warmed them through before serving. We also removed one of the pork shoulders (at this point it’s cooked all the way) to make even more room. But if you have the room in the pot or are making the smaller batch, then you can leave it all in! Up to you. Just be VERY careful when scooping things out or moving things around in there, everything has been cooking so long that it can break apart if not handled gently! 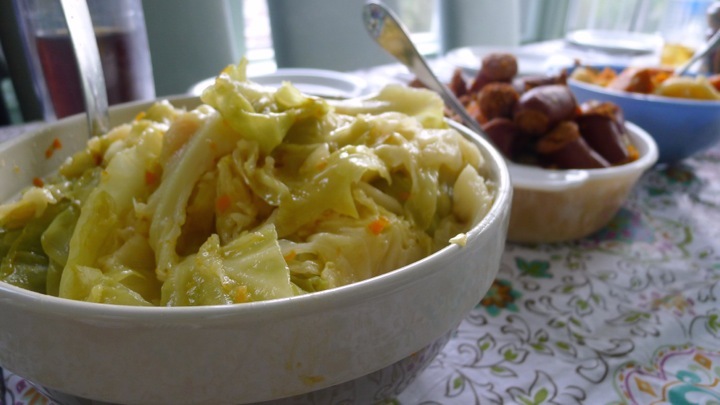 Once the cabbage is added, cook for one more hour. 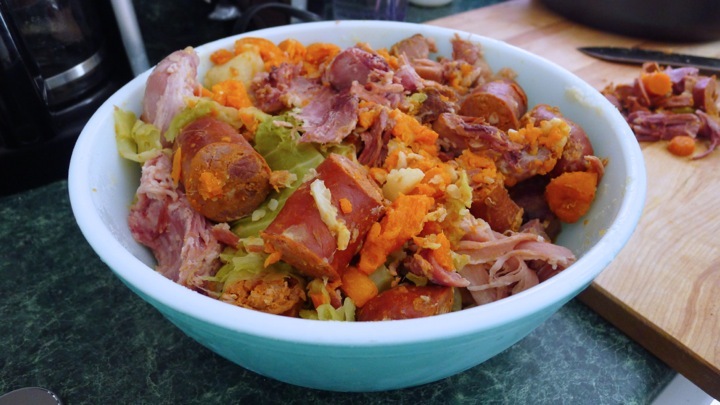 To serve, plate all ingredients in separate bowls and pass around the table! 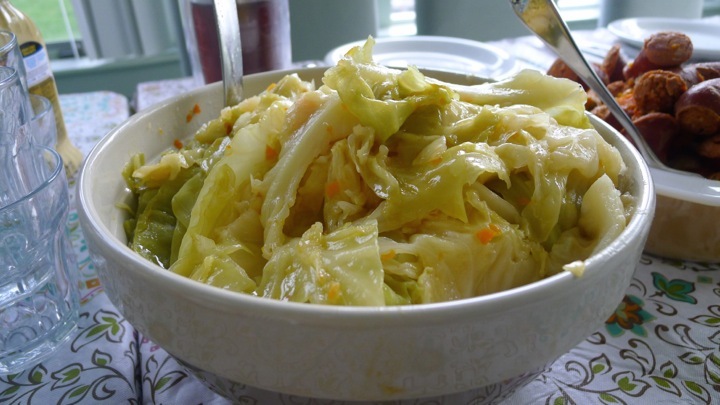 We love to put apple cider vinegar on our cabbage and potatoes. 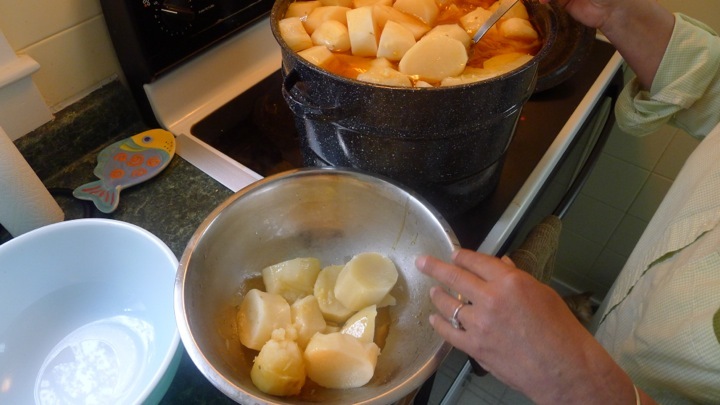 We also keep butter on the table as well, depending on how people like to eat their boiled dinner! Thanks mom for sharing this recipe with me, I can’t wait to teach my future kiddo how to make it one day as well. Love you! 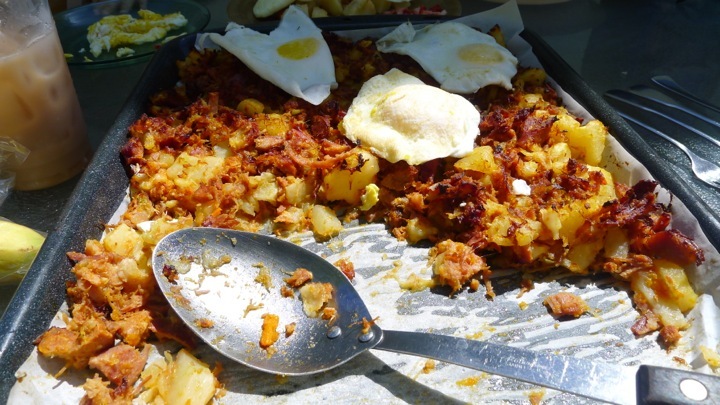 HASH MADE FROM THE LEFTOVERS! 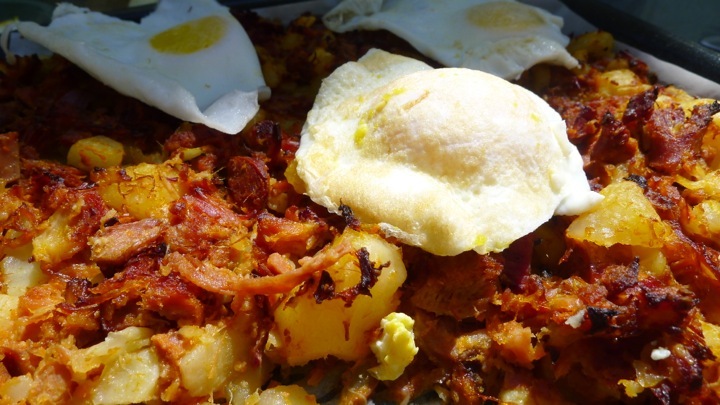 To make the hash, simply chop up the leftovers and add to a frying pan, cooking for about 15 minutes. Next add it to a baking sheet and place in the oven on 350 degrees for another 15-20 minutes or until crispy. 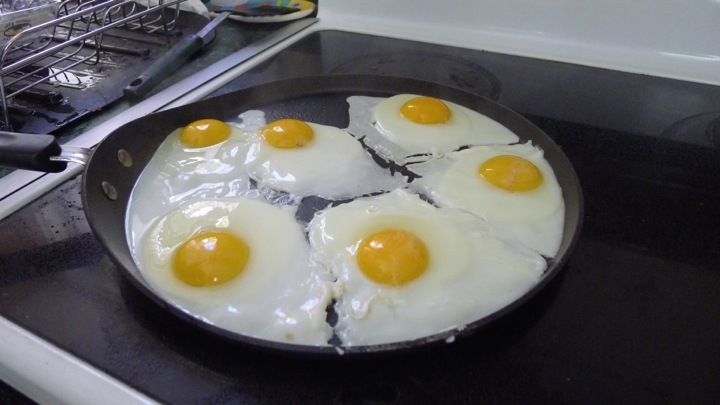 Top with some runny poached or fried eggs! 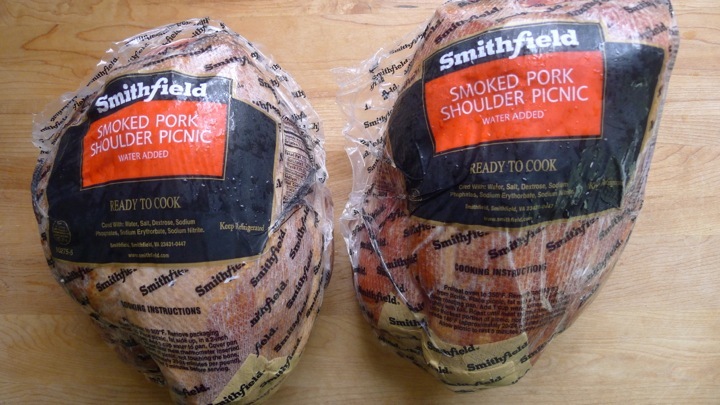 Hi, how many pounds are each of the picnic shoulders? They vary in size in the store. Thank you!